THE versatile Dorset-based ImpAct theatre will be working with the Bourne­mouth Borough Council Think Bike! 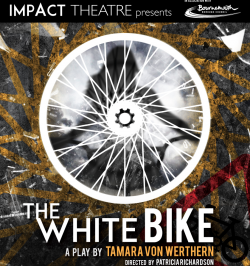 campaign to stage Tamara von Werthern’s play The White Bike over four nights in the coming month. The performances, on 16th 17th and 30th April and 1st May, will be the amateur premiere of the work, and the company is working with the writer on the production. The White Bike is an imaginative play about how an ordinary cycle ride to work can have extraordinary consequences. Inspired by a true event, Tamara von Werthern’s beautifully constructed and thought-provoking piece takes its audiences on a journey showing what happens when our world is turned upside down. The play will be performed at the Layard Theatre at Canford School on Tuesday 16th and Wednesday 17th April, and at the Shelley Theatre in Boscombe, Bourne­mouth on Tuesday 30th April and Wednes­day 1st May. All performances start at 8pm.